This simple recipe is a fantastically sweet, juicy, and bright blueberry with lighter peach notes to satisfy your summer vape craving. This recipe was created with some inspiration from @kriswk. HS Blueberry: This is slowly becoming one of my favorite blueberry flavors. Go ahead and get yourself a 30mL bottle of this flavor if you enjoy blueberry flavors. It is sweet and candy like and almost tastes blue. Sort of has this blue raspberry taste that makes it just wonderful. Seriously, smell this concentrate and tell me it doesn't remind you of blue raspberry. If you are trying to create a blue raspberry profile, this would be a great base to build around. FW Blueberry: Still my favorite blueberry out. This, to me, tastes like a blueberry filling that doesn't have a lot of dark berry or musky flavor that I don't care for. While this flavor is great, I haven't had the best experience when using it by itself as the main blueberry flavor in a recipe. So in this case, it just helps push the blue, sweet, and slightly tart flavor of HS Blueberry. FA Pear: I used this just help with sweetness and giving the overall profile a bit more juiciness. I also think FA Pear helps tame that almost sweaty sock flavor you can get from peach flavors. FA White Peach and INW Peach: Like I said, I often get sweaty sock flavor from peaches, but these two are the flavors I get the least sock flavor from when kept at low percentages. INW Peach can taste like peach rings at 2-3% and I didn't want that in this recipe. I wanted more of a syrupy sweet peach to accent the over all profile so I found 0.5% INW Peach to do exactly that. 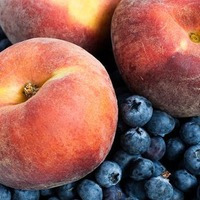 I'm not sure what a white peach tastes like, but to me the FA White Peach is just here to lighten up and fill out the peach portion of this recipe to create a win win light peach combo that fits well with the blueberry combo. CAP Super Sweet: This is definitely optional (about 1 drop per 30mL or 2 drops/30mL for other sweeteners) since HS Blueberry and FA Pear are both pretty sweet on their own, but I feel this adds just enough sweetness to make everything a little more bold. Tasty, juicy, and well thought out recipe. The flavor was a bit light for my taste but the peach was nice and authentic. The blueberry felt just a tad out of place as it was a bit more artificial/syrupy than the other components. I might have added a touch of bilberry if realism was the goal, but otherwise, nice combo. That said, this recipe wasn't very more-ish to me and it kept getting pushed to the back of the cabinet but I did eventually finish my 30mL. Don't let my words detract from the fact that this really is a nice fruity vape that I'm sure most folks will love. This fantastic little number really nails the blueberry/peach combination. The blueberry is lush, sweet, and a little tart. When you hit that moment it's going to become a little sour, the peach kicks in and surrounds everything with its juicy sweetness. It's like someone found a way to perfectly combine those two fruits. Seriously, this would be my argument in favor of genetically modifying food, and may win over some converts to that camp. This is for fruit fans, people who like a good mixture of tart and sweet, and those who wonder what their smoothies would be like if you could get one in edible form. This is different in all the right ways. Very nicely done! Excellent pairing of a dark and bright peach and the blueberries are hard to argue, Great Job!!! Im not normally a person that likes peach but I love what the candy HS Blueberry is doing to it here. Great recipe. I was lucky enough to get to preview this one and found it to be a full-flavored and well-rounded refreshing fruit recipe that delivered everything it promised and introduced me to a fantastic new blueberry option.